Learning a new language may seem a little imposing, but there are many techniques we use in our French school in Melbourne that not only makes learning French easier, it also makes it enjoyable. Using French film to engage you works well as it encourages you to listen to the language, work at a pace, which is typical of conversation and offers the opportunity for you to follow along with sub-titles when you start feeling lost. This is a great technique to do on your own or as well. Seeking out classes that offer you true to life situations you will encounter in your travels will work wonders for building your confidence. Shopping is a common tourist past time and learning how to interact with shop people will help you interact effectively so you don’t end up ordering a lamp when you wanted a scarf. Singing subject matter has often been a technique used by parents to get their children to remember and learn. Using music to learn a language works well in many ways. It introduces you to their culture while allowing you to hear proper pronunciation with improved retention. Allow yourself the opportunity to emerge yourself in the culture of the language. Don’t stick out like a sore thumb on your travels, or worse inadvertently insult or offend people by not understanding their culture. We offer classes that not only teach the language but how to interact like a local. Or loosely translated, surf the web in French. It is the third most common language used on the web. Test your skills by searching and reading information in French. 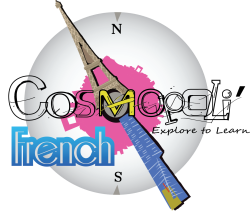 We offer and encourage all of these tactics at Cosmopoli’French to help you develop your French skills both in comprehension as well as culturally. You will enhance your understanding of proper pronunciation as well as discover real phrases and interactions for real life situations.